By default, IIS provides HTTP.sys as the protocol listener that listens for HTTP and HTTPS requests. HTTP.sys was introduced in IIS 6.0 as an HTTP-specific protocol listener for HTTP requests. HTTP.sys remains the HTTP listener in IIS 7 and later, but includes support for Secure Sockets Layer (SSL). In IIS 6.0, HTTP.sys replaced Windows Sockets API (Winsock), which was a user-mode component used by previous versions of IIS to receive HTTP requests and send HTTP responses. IIS 7 and later continue to rely on HTTP.sys for HTTP requests. In IIS 7 and later, functionality that was previously handled by the World Wide Web Publishing Service (WWW Service) alone is now split between two services: WWW Service and a new service, Windows Process Activation Service (WAS). These two services run as LocalSystem in the same Svchost.exe process, and share the same binaries. You may also see the WWW Service referred to as W3SVC in documentation. 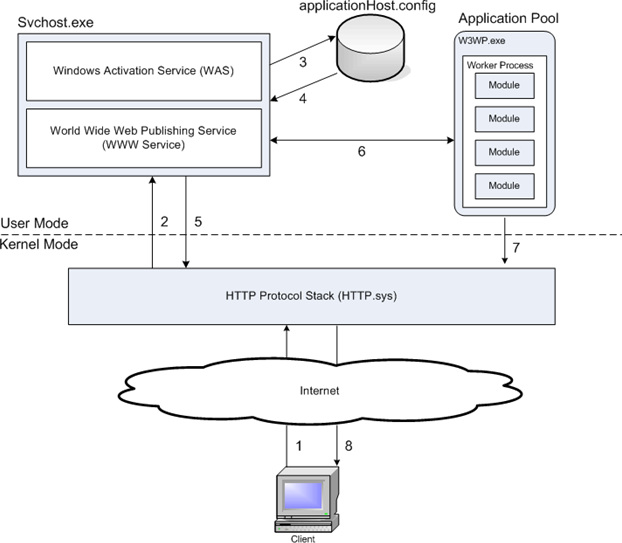 In IIS 7 and later, Windows Process Activation Service (WAS) manages application pool configuration and worker processes instead of the WWW Service. This enables you to use the same configuration and process model for HTTP and non-HTTP sites. Additionally, you can run WAS without the WWW Service if you do not need HTTP functionality. For example, you can manage a Web service through a WCF listener adapter, such as NetTcpActivator, without running the WWW Service if you do not need to listen for HTTP requests in HTTP.sys. For information about WCF listener adapters and about how to host WCF applications in IIS 7 and later by using WAS, see Hosting in WCF on MSDN. Because WAS manages processes for both HTTP and non-HTTP protocols, you can run applications with different protocols in the same application pool. For example, you can develop an application, such as an XML service, and host it over both HTTP and net.tcp. The new architecture also improves security and simplifies administration. By removing unnecessary modules, you reduce the server's attack surface and memory footprint, which is the amount of memory that server worker processes use on the machine. You also eliminate the need to manage features that are unnecessary for your sites and applications. The following sections describe the native modules that are available with a full installation of IIS 7 and later. You can remove them or replace them with custom modules, depending on your needs. Several modules in IIS 7 and later perform tasks specific to Hypertext Transfer Protocol (HTTP) in the request-processing pipeline. HTTP modules include modules to respond to information and inquiries sent in client headers, to return HTTP errors, to redirect requests, and more. 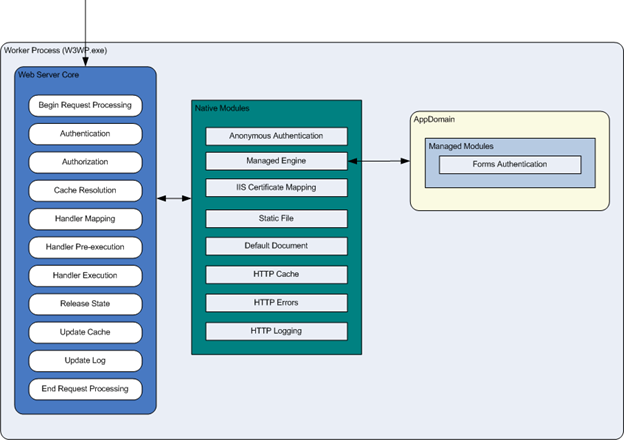 Several modules in IIS perform tasks related to content in the request-processing pipeline. Content modules include modules to process requests for static files, to return a default page when a client doesn't specify a resource in a request, to list the contents of a directory, and more. Managed modules depend on the ManagedEngine module. The following table lists the managed modules that are available with a full installation of IIS 7 and later. For more information about the managed modules, see the .NET Framework SDK 2.0 on MSDN. Application pools separate applications by process boundaries to prevent an application from affecting another application on the server. In IIS 7 and later, application pools continue to use IIS 6.0 worker process isolation mode. In addition, you can now specify a setting that determines how to process requests that involve managed resources: Integrated mode or Classic mode. In IIS 6.0, worker process isolation mode and IIS 5.0 isolation mode are set at the server level. This makes it impossible to run both isolation modes on the same server. However, in IIS 7 and later, Integrated mode and Classic mode are set at the application pool level, which enables you to run applications simultaneously in application pools with different process modes on the same server. IIS 7 and later have a similar HTTP request-processing flow as IIS 6.0. The diagrams in this section provide an overview of an HTTP request in process. In a worker process, an HTTP request passes through several ordered steps, called events, in the Web Server Core. At each event, a native module processes part of the request, such as authenticating the user or adding information to the event log. If a request requires a managed module, the native ManagedEngine module creates an AppDomain, where the managed module can perform the necessary processing, such as authenticating a user with Forms authentication. When the request passes through all of the events in the Web Server Core, the response is returned to HTTP.sys. Figure 2, below, shows an HTTP request entering the worker process.